When you play with building blocks, you tap into creative and analytical spaces in your mind. Pinblock Freestyle is a whole new kind of building block system that gives kids a new way to build that feels familiar and different at the same time. The Pinblock system is based on a single versatile shape that firmly connects to other shapes while still allowing flexibility thanks to its beveled edges. Pinblocks can stack to form structures with extremely stable bases or aligned to create flexible constructions. The two-prong blocks lend themselves to making wearable toys like bracelets as easily as creating sheets of 2D pixel art. Build something new with Pinblock Freestyle! Pinblock Freestyle is a system that gives you the freedom to build all sorts of different things. 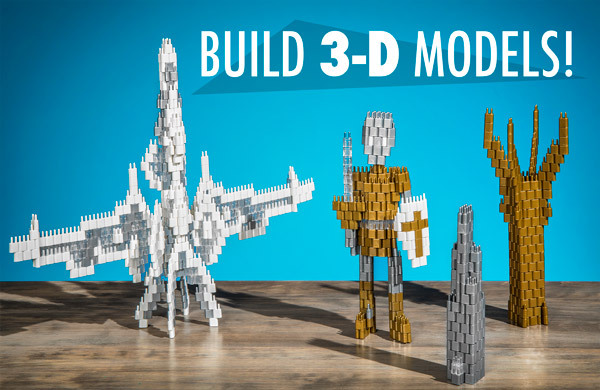 The single type of building block is versatile enough to build three dimensional objects like vehicles and buildings, create wearable sculptures, and make 2D pixel art. Oh, the things you’ll build! There's a watch in that photo! The unique capabilities of Pinblocks make them ideal to build sturdy feats of engineering that are both uniquely creative and durable enough to stand in the real world. Whether you’re making a fantasy castle or a futuristic vehicle, Pinblocks are versatile enough to create anything you can dream up. You can’t tell from the picture, but these look cool from every angle. 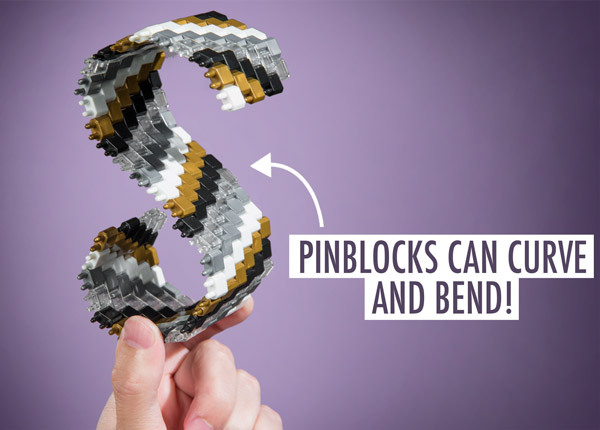 Pinblocks introduce a new dynamic to block-building systems never seen before: they can be made to bend! While each individual block is sturdy and rigid, they can be put together in sheets that maintain structural integrity while flexing, curving, and bending. Structures that flex are a game changer. Let’s see Legos do that. The entire Pinblock system is built on a single shape designed for maximum fun. 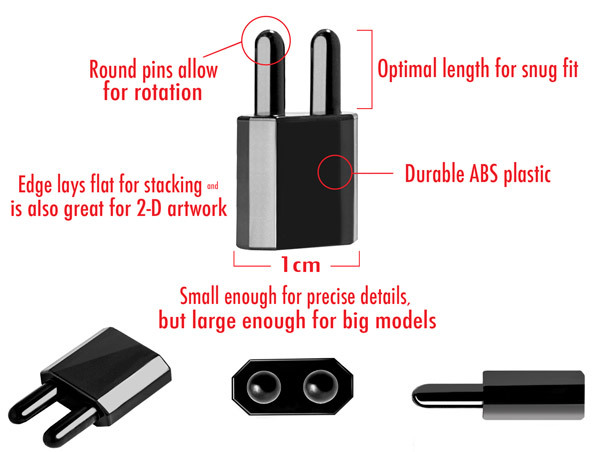 The long round pins securely fit with other Pinblocks while allowing for flexibility and rotation. Each block’s flat surface stacks well for the depth of a 3D model and also lays flat for 2D pixel art. And each Pinblock has a Goldilocks-sized 1 cm width that allows you to make large structures while enabling fine detail in your work too. A thing of beauty. And you can make beautiful things with them, too. The flat, interlocking shapes of Pinblocks enable artistic expression not only in building objects but also in designing an image. Think of each individual Pinblock as a pixel. You can connect them to create a bigger picture that looks like random squares of color up close and a detailed picture from farther away. 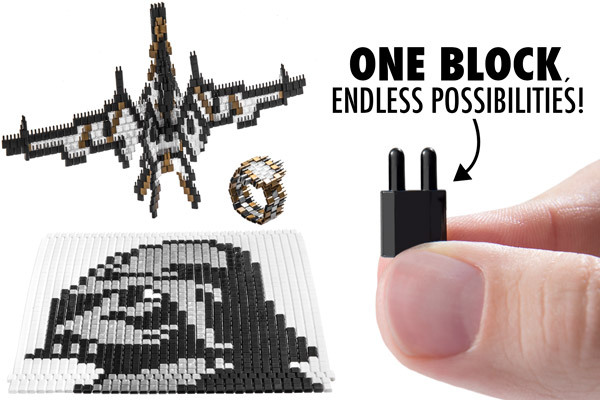 Pinblock Freestyle comes with one thousand Pinblocks in five different colors. You could make dozens of detailed models or one giant structure. 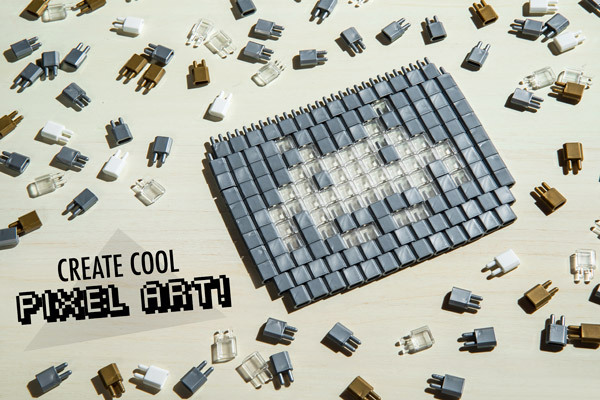 Put together some wearables, take them apart, and make some pixel art. Then remix it and build a model of your favorite instrument. 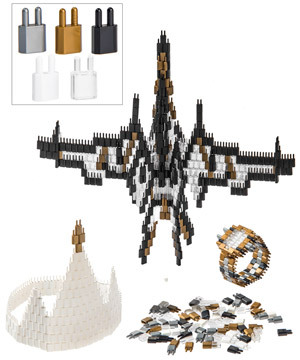 With 1,000 pieces, the biggest limit to what you can make is your imagination. So get playing with Pinblocks Freestyle! 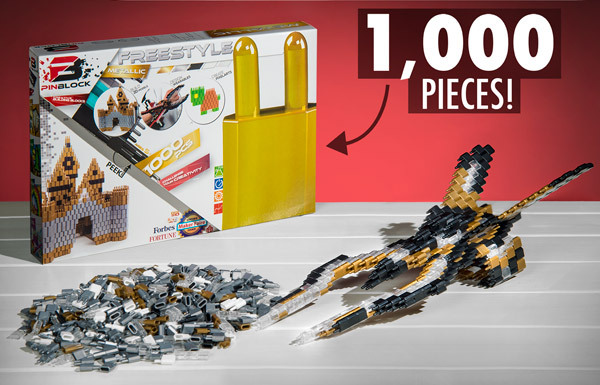 1K pieces = ∞ fun. Question: Are these off-brand Lego bricks? Answer: Nope. We think Legos are great, but Pinblocks are a totally different kind of building system. Question: How can you make different shapes with just one block? Answer: The unique beveled edges and round pins of Pinblocks allow them to take many forms.